» Map Preview on Healthy Food will be January 12th Ride South L.A.
Save the date everyone! 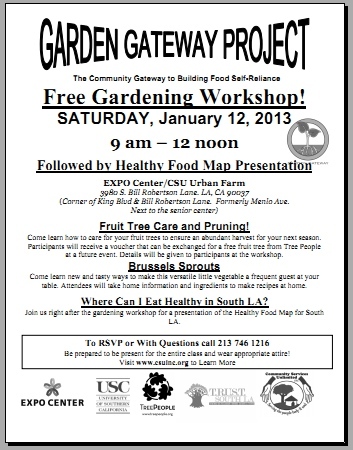 We will be previewing our first healthy food map on Saturday, January 12th, 2013 in Los Angeles. We want your feedback. Our demo will happen alongside a Garden Gateway workshop and tree giveaway from our partner CSU. See the flyer below for details on CSU’s event. We will demo the map toward the end of the free gardening workshop from 9am-12noon, and probably a bit after 11am at the EXPO Center/CSU Urban Farm, 3980 S. Bill Robertson Lane. LA, CA 90037 (Corner of King Blvd & Bill Robertson Lane. Formerly Menlo Ave. Next to the senior center). If you want to know more about our upcoming events and community projects, sign up for our newsletter.